Thanksgiving is tomorrow and I’ve got turkey on my mind). Once I’ve eaten my share of carbs, I’ll be focused on decking my halls and sometimes a little planning is in order to get blooms in time for Christmas. Since I can’t force my kids to clean their rooms (without lots of nagging), I’m thrilled that I can force bulbs into submission. 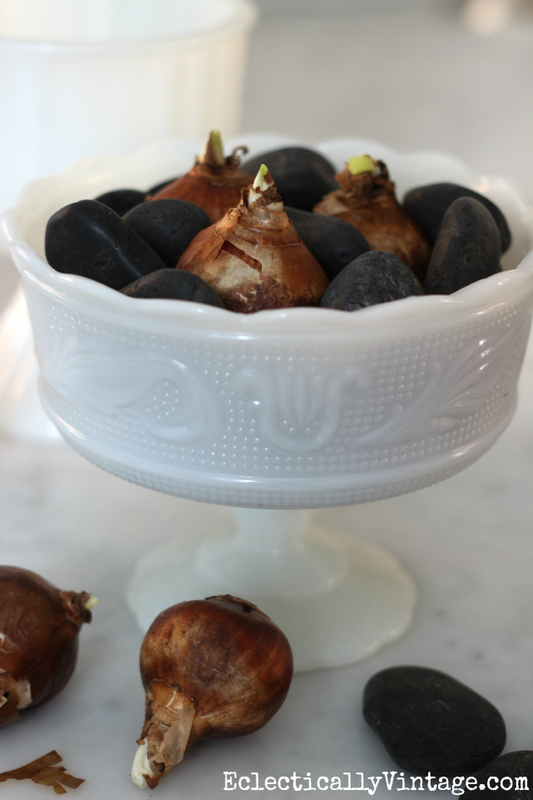 What’s better than a winter centerpiece straight from nature. 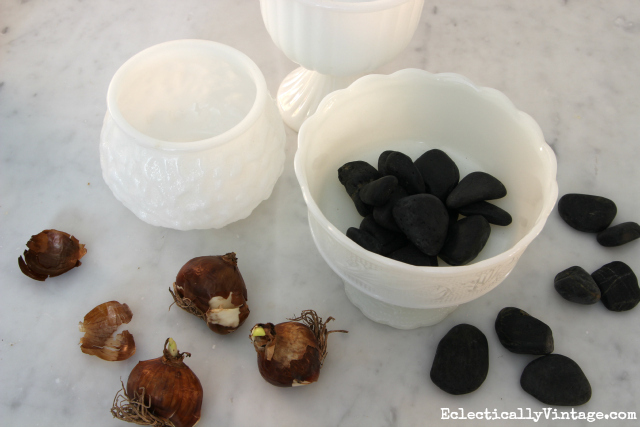 I love adding bulbs to a few different containers and gathering them together for a unique centerpiece. 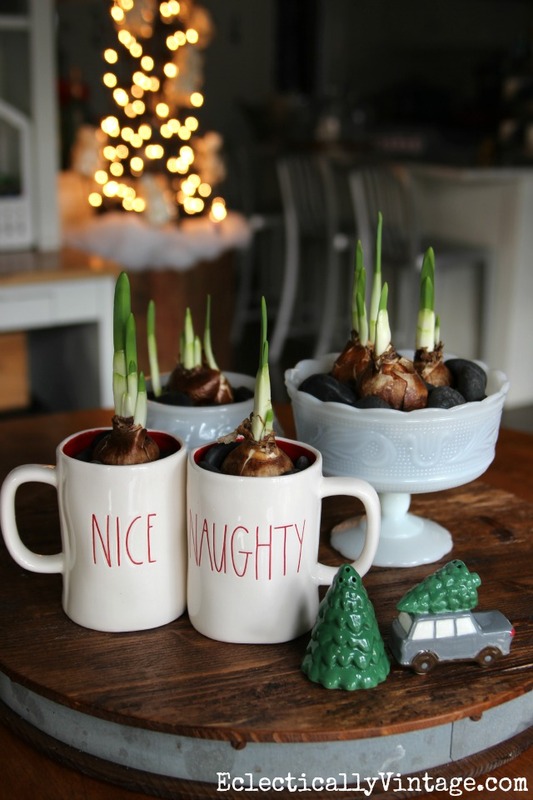 They also make the perfect hostess gift – bring them when they are just beginning to sprout so they can enjoy watching them bloom. I love how the white milk glass and fun naughty and nice mugs from HomeGoods look on my rustic reclaimed wood lazy susan. Cute car and tree salt and pepper shakers complete this simple centerpiece. It takes about 4-6 weeks for the flowers to bloom so start forcing! P.S. Make sure to check out my favorite fall centerpiece of all time here – with instructions on how to make your own (and impress friends, family and random strangers)! 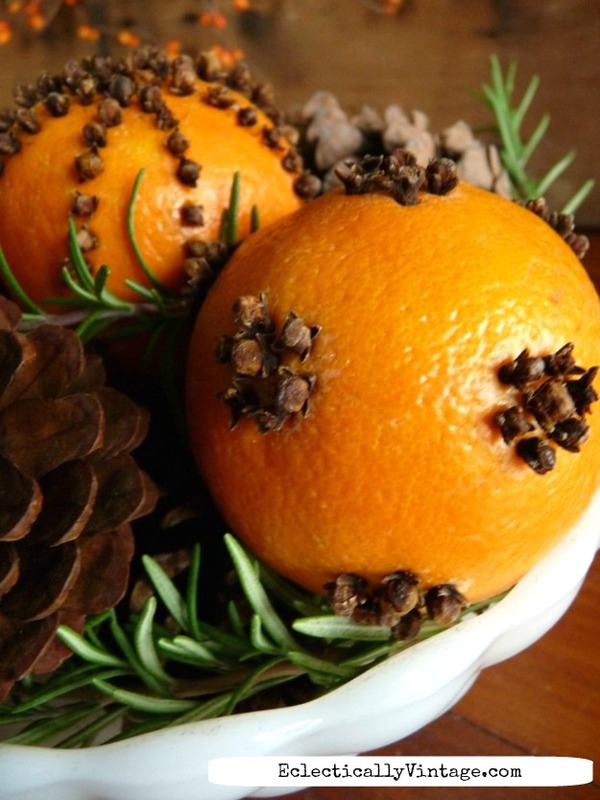 See how to make orange pomanders – they smell amazing! 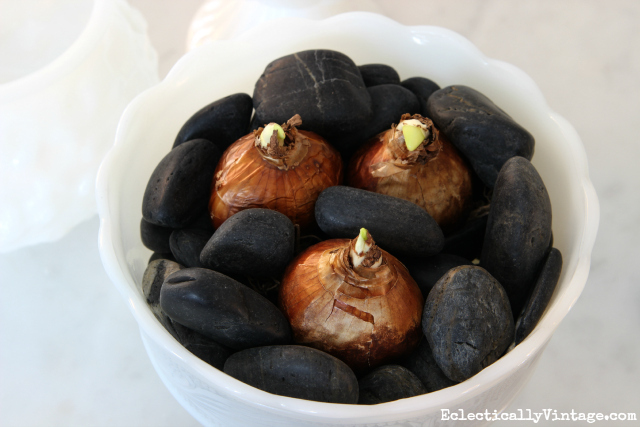 I haven’t forced bulbs the last few years, but think now I need to! Happy Thanksgiving, Kelly! Hope you and your family have a wonderful Thanksgiving Heidi! This sounds like a great idea. I have never forced bulbs but know it is not hard, you and your family have a Happy Thanksgiving, and Sushi too! Hope you and your family have a wonderful Thanksgiving too Marlene! Bring on the carbs! 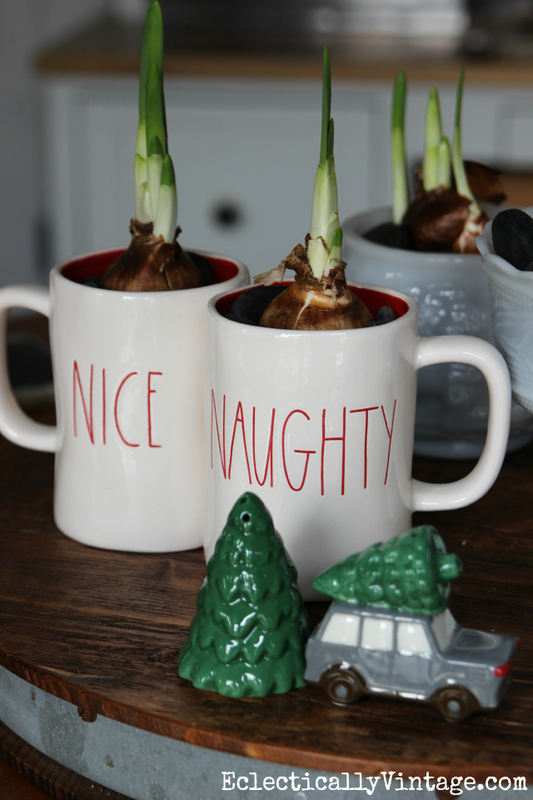 I was wondering if you have a great place to buy your bulbs? They are very hard to find at a good price here in CT. Thankyou, I like the centerpiece ideas! HI Sue – I bought mine at Home Depot. You get get bags of them pretty inexpensively. Happy Thanksgiving! Thanks Kelly, I never thought to look there! Happy Thanksgiving to you as well! 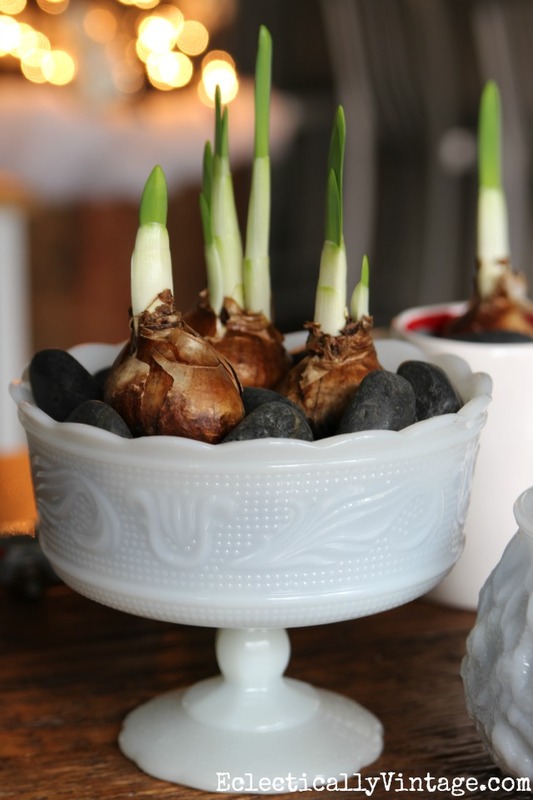 Make sure the bulb doesn’t touch the water – only the roots. I don’t use carbon or alcohol. Hope that helps Angelica!